It’s always an interesting exercise as an historian to contemplate the “what ifs” of history. Edward VI of England is just one of those cases. Would he have been the epitome of a Protestant humanist, ruling with a velvet touch? Or would he have become a tyrant like his father? What if he had married Mary Queen of Scots? He certainly showed a lot of promise but he didn’t live long enough for us to find out. 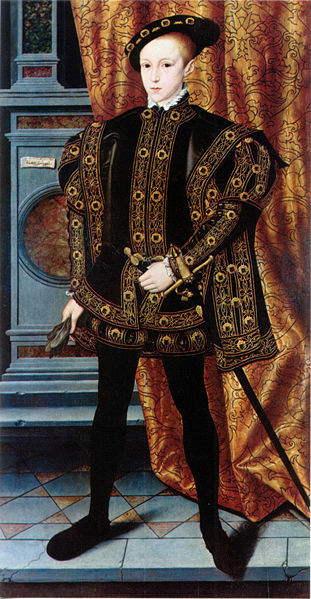 Edward was born on October 12, 1537 at Hampton Court Palace. He was the only surviving legitimate son of the legendary Henry VIII of England. His mother was Jane Seymour, Henry’s third wife. Henry wept with joy as he held his long-awaited son. At eight o’clock the morning of his birth, a “Te Deum” was sung in all the parish churches of London and an official procession was made at St. Paul’s Cathedral in the presence of many notables, including the French ambassador. The bells of the city rang until ten in the evening while bonfires were lit and the guns of the Tower sounded. Wine flowed. On the 15th of October, Edward was christened in the royal chapel at Hampton Court which had recently been redecorated by the king. Standing as godfathers were Archbishop Cranmer and the Duke of Norfolk. Edward’s half-sister Princess Mary was named godmother. Henry’s friend Charles Brandon, Duke of Suffolk served as godfather at the confirmation which followed the christening. 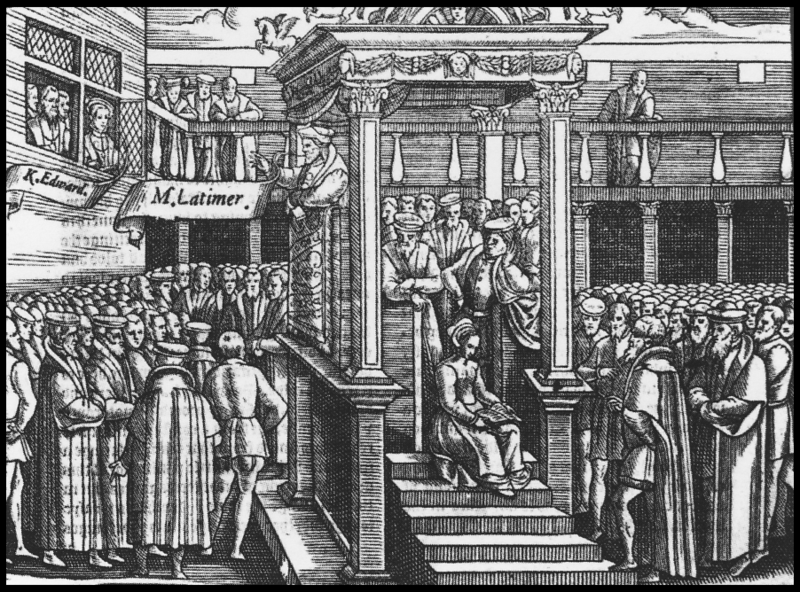 Edward’s other half-sister, the Princess Elizabeth, brought the baptismal chrism as she was carried to the ceremony by Edward Seymour, Queen Jane’s brother. Jane’s other brother Thomas held the canopy over the baby’s head. At the baptism, Edward was proclaimed duke of Cornwall. After the ceremony, he was taken to his mother’s chamber where Jane and the king gave him a formal blessing. After giving birth, Jane seemed to recover for a few days but then fell gravely ill with a fever. She died twelve days after giving birth. Henry was devastated by her death but at least he had the male heir for which he had basically torn England apart to get. Edward was given his own household establishment which was dominated by women such as the lady mistress, rockers and wet nurses. Henry was deathly afraid of illness and Edward was moved to different houses and protected and sheltered as much as possible to avoid infection. When Edward was four years old, he began his studies, being taught by two of the best tutors Cambridge had to offer. His studies were interrupted in the fall of 1541 when he fell ill with malaria which he caught at Hampton Court. His life hung in the balance for days but he did eventually recover. The Treaty of Greenwich was brokered in July of 1543 between Scotland and England which included a provision for Edward’s betrothal to the seven month old Mary Queen of Scots. That same month, King Henry married his sixth and last wife, Katherine Parr. This marriage would have a significant impact on Edward’s emotional and educational life. Katherine brought all of Henry’s children together under one roof and they lived as an intimate family. Edward had a very warm affection for Katherine, calling her his “dearest mother”. When King Henry left England to invade France in July of 1544, he named Katherine his regent-general and she was given charge of Edward’s household. All new servants and tutors were named and Edward began in earnest rigorous lessons in the Protestant religion, scripture, and the classics. He was on his way to receiving the finest humanist education of a prince of his era. Edward was joined in the classroom by other young noble boys, studying books of Cato, Erasmus, Cicero, Herodotus, and Plutarch, some of Aesop’s fables, biblical texts and “Vives Satellium” in Latin which had been written for his sister Mary. He excelled at rhetoric and was instructed in mathematics and astronomy. He began learning French in 1546 and was showing great progress in the language by 1550-51. 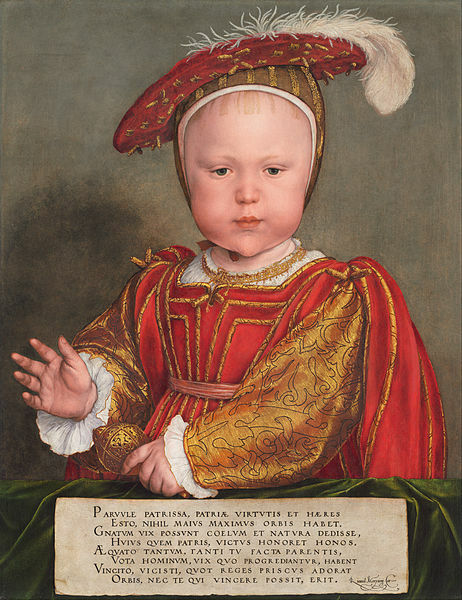 King Henry VIII died on January 28, 1547. Edward’s uncle, Edward Seymour, Earl of Hertford, took him to Enfield where the Princess Elizabeth was living. He informed the two children of their father’s death and they hugged each other, sobbing. Edward was now king. The Succession Act of 1536 had permitted Henry to make provisions in his will to appoint guardians in the event his heir was a minor. His will named a group of executors with an additional council to assist them. However, on January 31, the executors chose to name the Earl of Hertford as Protector of the Realm and by March a new council of twenty-six was named. Following this, many of the council were elevated to higher titles and some were given new titles. The Earl of Hertford was granted the title of Duke of Somerset. Also, crown land was distributed to many along with other handouts. Somerset’s younger brother Thomas, Baron Seymour of Sudeley wasn’t happy with these events. He had to be bought off with crown lands, made a privy councilor and named Lord Admiral. Edward rode by horse to London and arrived on January 31. On February 1, the king sat in his presence chamber on his chair of state as nobles gathered around him. They knelt before him one by one, kissing his hand and saying “God save your grace”. King Henry’s will was read aloud and the executor’s stated they had named Somerset as Protector. Somerset gave a short speech, asking for the council’s assistance. They all agreed with one voice. They all shouted “God save the King” and Edward doffed his cap in acknowledgement. After King Henry’s funeral and burial, plans commenced for Edward’s coronation. On the afternoon of February 19, Edward left the Tower of London to process to Westminster Palace. He rode on horseback dressed in a gown of cloth of gold with a sable lined cape. Underneath he wore a jerkin and cape of white velvet embroidered with Venetian silver decorated with rubies, diamonds and pearls in lovers’ knots. The horse was also covered in crimson satin embroidered with pearls and gold. Followed and surrounded by many members of his household and notables, Edward progressed along streets lined with merchants and the people with houses draped in tapestries, banners and streamers. They stopped along the route to witness pageants. It took the procession four hours to reach Westminster. Very early the next day, Edward went by river to Whitehall where he put on his parliament robes of crimson velvet. The entire party went on foot to Westminster Abbey where Edward was crowned and anointed. That evening there was a ceremonial banquet in Westminster Hall. The Treaty of Greenwich was never ratified by Scotland and stability was hard to come by. Armed conflict was ongoing. Both nations were preparing for hostilities and in September, Somerset led an army to a great victory at Pinkie on September 10. However, the English couldn’t gain the upper hand and by January 1548, the Scots were discussing a marriage between their queen and the French dauphin. In June of 1548, a large expeditionary force from France landed in Scotland and besieged Haddington while negotiating a marriage agreement which was finalized on July 7. Mary was spirited away to France to be brought up at court until she reached marriageable age. Somerset’s government was planning another offensive in Scotland for the summer of 1549 but there was much economic instability and rebellion in England during that summer. Edward’s government was always short of funds. Also, the new Book of Common Prayer had been distributed to all the churches, causing confusion and unrest among the people. There was strong resistance to religious change. In August, King Henri II of France declared war on England and besieged Boulogne. But the English strongly resisted. A peace treaty was brokered on March 28, 1550 and Boulogne was surrendered to the French. We don’t know how Edward felt about the loss of his bride or if he endorsed the Scottish campaigns but from his diary, we know he enjoyed hearing about the exploits of his troops. Somerset’s power as Protector was strengthened after his victory at Pinkie but he was facing some opposition. Edward complained in his diary that his uncle dealt harshly with him and kept him in financial straits. His other uncle, Thomas, Baron Sudeley had protested the fact that his brother had all the power. In past cases, when there were two uncles, it was the custom for both to have a role in the regency. Sudeley was attempting to gain the king’s confidence by gaining access to his chambers and giving him money. Edward may have felt Sudeley would have been easier to deal with than Somerset but he never endorsed him to any position of power. Sudeley was gaining the confidence of some of the nobles and the men on the council. He assembled weapons and men and fortified the castle at Holt. Somerset controlled production of letters in Edward’s hand. Sudeley was trying to get a letter ending Somerset’s governorship and giving it to him. In August of 1548, Edward’s chamber was secured to keep Sudeley away. Shortly after this, he tried to enter Edward’s bedroom at St. James Palace and found the door locked. He shot the king’s barking dog. Edward stood in the doorway in his nightshirt, obviously frightened. When Sudeley’s wife, the former queen Katherine Parr died in September of 1548 after giving birth to a daughter, Sudeley began conspiring to marry the king’s sister Elizabeth. On January 17, 1549, Sudeley was arrested, interrogated and attainted by Act of Parliament. He was executed on March 19. There was more agrarian unrest in the kingdom in the summer of 1549. Somerset was now in trouble. His handling of foreign affairs and the local rebellions had not been swift or effective. In October he withdrew to Windsor taking Edward with him. The other councilors reminded Somerset his power was given to him by them and by October 11, Somerset was separated from the king and put under guard. He was interrogated in the Tower and charged with twenty-nine articles. As Edward explained, they included ambition, vainglory, entering into rash wars, and negligence in holding onto Boulogne, enriching himself with his treasure and following his own opinion. Due to maneuvering on the council, Somerset was released from prison in February 1550 and given a free pardon by Edward. By April he was back on the council. However, the leadership of the government had been taken over by John Dudley, Earl of Warwick, and later Duke of Northumberland. Edward was now greatly under his influence. Edward did nothing without Northumberland’s guidance. In July of 1551, Edward was betrothed to Elisabeth of Valois, eldest daughter of King Henri II of France. Edward was beginning to mature and while he didn’t take control of his government, he was being educated and was able to grasp the inner workings so that when he came of age, he would be able to rule with the familiarity he needed. During Northumberland’s tenure, there were bad harvests and outbreaks of disease. In-fighting broke out between him and Somerset. In October of 1551, Somerset was arrested and he was tried by his peers in December. He was found guilty and beheaded on January 22, 1552. We don’t know how Edward felt about the loss of his uncle and mentor. Northumberland concluded the military endeavors started by Somerset by ending the war with Scotland and brokering peace with France. He abandoned the monetary policy of debasement of the coinage, curbed government spending and managed to liquidate England’s overseas debt. Working with William Cecil, he enhanced and streamlined the procedures of the council. He may also have worked with the king conspiring to bypass Princess Mary as his heir and putting Lady Jane Grey on the throne in the event of the king’s death. Edward’s court was sumptuous and full of pomp and circumstance. Edward dressed in luxurious clothes and had a penchant for buying expensive jewels. Ambassadors noted the intricate courtly rituals. In October of 1551, Marie de Guise, the Scottish regent planned to visit her daughter, Mary Queen of Scots in France. On the way she came to London where Edward put on a show to impress her. She dined with him at Hampton Court. Edward was exasperated with his sister Mary. She was Catherine of Aragon’s daughter and had been brought up as a staunch Catholic. When the new Book of Common Prayer was released, Mary refused to conform to it. Edward and his government pressured her to the point where she wanted to escape from the kingdom. All efforts to relieve her failed. In March of 1551, Mary and Edward met privately. The meeting did not go well. However, Mary continued to hear Mass even though some of her household were arrested and removed for doing so. In February of 1553, Edward fell ill with a cold. His health degenerated into a lethal infection. There are various explanations for his final illness. He met with his sister Mary again in March but was wracked with a cough during the meeting. On June 21, he ordered his new “Devise” be authenticated under letters patent, naming his Protestant cousin Jane Grey as his heir and successor. On July 6, at Greenwich Palace, between eight and nine o’clock in the evening, Edward died in the arms of Sir Henry Sidney saying “I am faint; Lord have mercy upon me, and take my spirit”. Sidney said the king surrendered his spirit in great sweetness. All of his promise died with him. He was buried in the Tudor mausoleum, the Lady Chapel in Westminster Abbey, beside his grandparents, Henry VII and Elizabeth of York.